November 17, 2017 (Redmond, WA) – B.E. 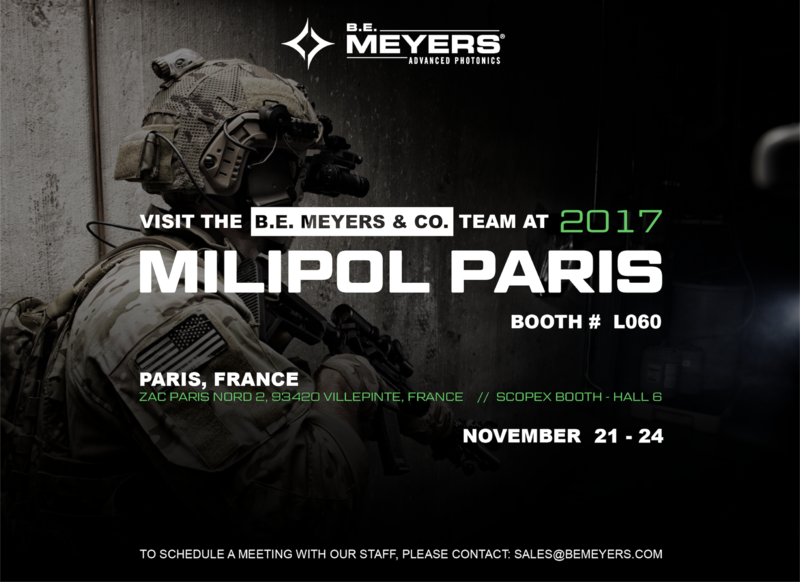 Meyers’ MAWL, GLARE, and IZLID series of lasers will be on display at the SCOPEX exhibit (booth #L060) on November 21-24, at Milipol Paris 2017. B.E. Meyers’ Modular Advanced Weapon Laser (MAWL), a high power infrared and visible green aiming and illumination laser for individual carbines, offers improved ergonomics, interface, and performance. The MAWL-DA has been designed from the ground up around the evolved needs of the modern night fighter and is currently in use and deployed on operations with both Tier 1 Special Forces, and internal security agencies in the U.S., Europe, and other nations. The LA-22/U (formerly known as the GLARE RECOIL), was selected by MARCORSYSCOM as the sole source Hail and Warning device for the U.S. Marine Corps’ Ocular Interruption Systems (OIS) program. It features B.E. Meyers’ patented SmartRange™ technology that utilizes laser range finding and near-field detection to self-regulate power output. The result is controlled EyeSafe™ irradiance in addition to maximum permissible exposure on target. B.E. Meyers & Co. also offers a class 1M variant of the LA-22/U, the GLARE HELIOS. Also displayed at the SCOPEX exhibit will be the IZLID series of lasers for Pointing and Illumination, including the IZLID Ultra. The IZLID Ultra is currently the standard for JTAC use. Featuring a beam bright enough to communicate with high-altitude aircraft, it excels even under conditions containing high ambient light. B.E. Meyers & Co. Director of Business Development, Jamie Wilford, will be at the SCOPEX booth November 22-23 to provide detailed information about the company’s products. To connect with Mr. Wilford, or to schedule a meeting, please contact sales@bemeyers.com. For more information about B.E. Meyers & Co., Inc. visit www.bemeyers.com. Milipol Paris, the leading event for homeland security, is organized under the patronage of the French Ministry of Interior. It is an official event carried out in partnership with the French National Police and Gendarmerie, Civil Defence Service, French Customs, City Police, Interpol, etc.